Government websites outperformed private sector Web sites in a healthcare benchmark report released by ForeSee Results. Nearly 40,000 visitors were surveyed on healthcare websites during the month of October, 2009. 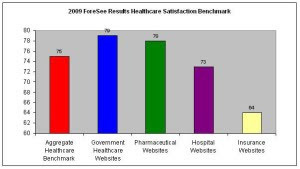 Government healthcare sites outperform all measured private-sector industries. In aggregate, government healthcare sites (79 on a 100-point scale) are performing better than any other category of healthcare site measured in the ForeSee Results benchmark. Pharmaceutical Web sites come in at a close second with an aggregate score of 78. Hospital Web sites score 73 in aggregate, and health insurance Web sites trail substantially, with an aggregate score of 64. A satisfied online customer is a valuable, profitable customer for healthcare organizations. Public image is only one reason why healthcare companies should be concerned with online customer satisfaction. Highly satisfied online customers are significantly more likely to become repeat customers, purchase more services, use the Web site as a primary resource, and recommend both the company and the website. Because customers purchase additional services and recommend that their friends and colleagues do the same, improving the online experience leads to increased revenue and cost savings. 153% more likely to use the website as their primary resource for interacting with a healthcare organization, instead of using more costly channels like call centers or office locations. "Health insurance companies have the most room for improvement and also the most to gain from focusing on the customer experience, because improvements can directly and quickly impact their bottom line," said Larry Freed, president and CEO of ForeSee Results. "Meanwhile, because of a long and focused effort on online satisfaction over nearly a decade, government-run healthcare Web sites are leading the pack and provide a positive example of how focusing on the customer experience has tangible results." Read the full report 2009 Healthcare Benchmark (PDF) from ForeSee Results.